Alienware’s Steam Machine is on the right track, but I can’t wholeheartedly recommend it. Alienware’s Steam Machine officially launches today. I really like what it tries to do. Since time immemorial, PC gaming has been regarded as a walled garden, a tree fort palace that only those with the hottest tech toys (and a masochistic love of complication) dare infiltrate. That reputation is, of course, overblown, but a seed of truth is what allowed it to take root in the first place. Alienware’s Steam Machine took me 15 minutes to set up. I removed it from the box, plugged it in, and had it fully updated in the time it took me to think about making a sandwich but then, at the last second, reconsider. It was, frankly, a more console-like experience than modern consoles offer. I was impressed as hell. The game library is limited. Remember, Steam Machines run Steam OS, which is a modified version of Linux. If the game you want to play doesn’t have a Linux version, no dice. There are currently over 1,000 Linux games on Steam, but a lot of heavy hitters aren’t on the list. I tried to install The Witcher 3, Grand Theft Auto V, and Metal Gear Solid V, all to no avail. In-home streaming is a little laggy. The potential solution to both of the above problems is to simply stream games to your Steam Machine from a Windows-enabled PC, but I’ve now used the feature in two different houses, and I’ve still encountered noticeable framerate drops and stutters. Using Valve’s Steam Link produced a noticeable improvement, but at that point why buy a Steam Machine at all? The interface is still kinda clunky. Valve isn’t fully done giving Steam OS/Steam Big Picture Mode a makeover, but even in The Streamlined Regions there’s a bit of clunk in Steam’s trunk. I could see newcomers being overwhelmed, especially when it comes to finding the games they want to play, figuring out if they’re Steam OS compatible, or—hell—understanding the difference between regular Steam and Steam OS. The store and library still need big improvements. Figuring out good controller configurations takes work. I already went into this in my piece about the Steam controller, but this is a big part of the overall Steam Machine equation. Fiddling with controller configurations is a big barrier to entry—another tedious trudge in the already (sometimes) intimidating process that is starting a new game. I’m glad the controller is so customizable, but it can be overwhelming. All that said, Alienware’s Steam Machine is still a solid mid-range gaming PC for $450. So far, my Steam Machine hasn’t had much trouble with any of the games I’ve thrown at it, including a couple on Ultra graphic settings. If you’re in the market for something pre-assembled, easy (ish) to use, and basically portable, that’s a tempting deal. There’s something vaguely magical, too, about playing PC-centric games like Kentucky Route Zero and Pillars of Eternity on the big screen, especially if you imagine an Xbox or PlayStation crackling in the fireplace while you do it. Oh, and you gain access to all sorts of Steam community features—a place where Steam offers significantly more quantity and breadth than the likes of Microsoft and Sony (though the quality of some of it is debatable). Frankly, though, I can’t wholeheartedly recommend this thing to anybody yet. If you’re a PC gaming newcomer, I’d say the barrier to entry here is still too high; in the process of trying to simplify some things (especially controls), Valve actually made them more complicated. Also, it’s limited by technically being a Linux machine. It’s a PC in console’s clothing, but it’s definitely still a PC at heart. On the other hand, if you’ve been using Steam since the service—and possibly also you—were in diapers, you’re better off just grabbing a Steam Link and streaming to your living room from your PC. Unless your current computer is ancient—more hamster wheel than machine—there’s just not a great reason to also own an Alienware Steam Machine. If you’re absolutely dying to have a discrete living room box, you can just grab the Alienware Alpha—which is a Windows machine with none of Steam OS’Linux limits—and use Steam Big Picture Mode on that. 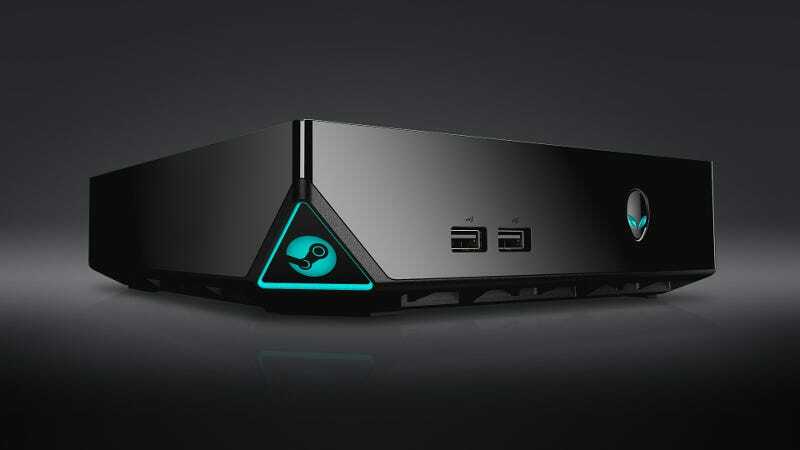 The Steam Machine has the potential to be everything great about PC gaming in an intuitive, quick-to-setup form factor. Already, it has more than a thousand games, not to mention the benefits of Steam’s general openness (mods, community creations, etc). It could become a great living room box—the perfect stepping stone into the world of PC gaming—but I wouldn’t recommend buying one right now when it’s still so early and, frankly, not the best option on the block. If you’ve already got a solid gaming PC, Valve’s own Steam Link is probably a better call—and it’s markedly cheaper. Get that.